Spring fever is spreading fast across much of the country. Many places have been teased by some warm spring temperatures. New vegetables, like asparagus, are starting to show up in some of the farmers markets. A sure sign of spring. Many participants are itching to get outside and start planting their spring gardens, but there is snow in some parts of the country. The days aren’t as dark as they used to be. Teresa (CA) from Not from a Box made beautiful French “peasant” beets with bucherondin cheese and a big hunk of ciabatta. This meal was both delicious and filling. 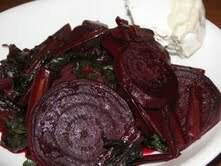 Beets are winding down for the season in her area, but they still have greens and root veggies available. New things are starting to pop up at the farmers markets, like asparagus and plenty of citrus (she’s in CA after all!) Stop by her blog to learn about her local resources. Teresa (CA) from Not from a Box also made what she called “dinner in a flash.” It is a challenge getting home late in the evening and coming up with a quick and good dinner. 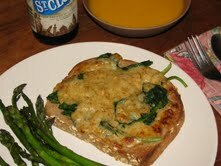 Teresa found a quick and easy meal when she made Welsh rarebit with spinach, creamy butternut squash soup and a side of roasted asparagus using mostly local ingredients around her area. She is right, rarebit is insanely easy. Head over to her blog to learn about her local resources and more. 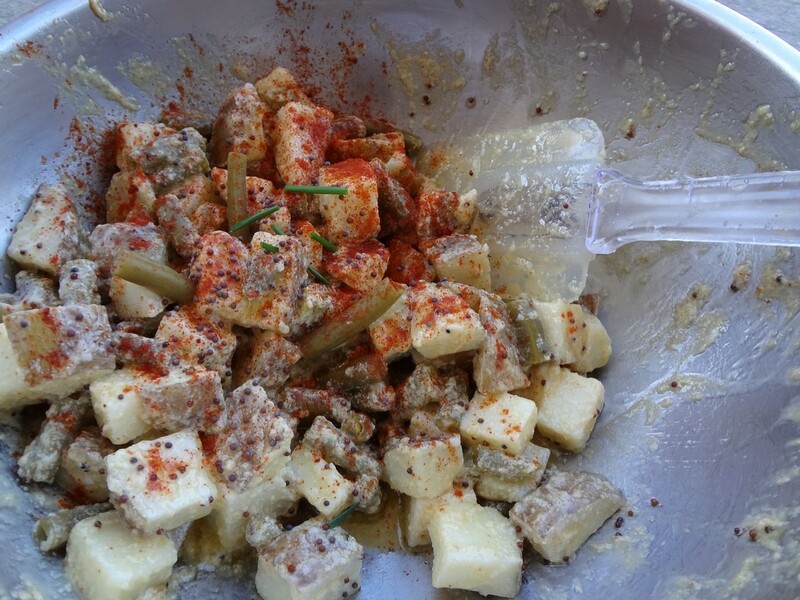 Julie (CO) from d.i.wine and dine made a nice dilly bean potato salad with garlic miso aioli this week. Not being a big fan of mayo, (that’s putting it mildy) she decided to tweak a recipe she found and make a miso aioli and use it in place of mayo helping to rank this the best potato salad she has ever had. She also used their own canned dilly beans and some locally grown potatoes. Visit her blog to see the receipt and more. I think the Upper Midwesterners are all outside enjoying this strange summer weather I think! Hard to take “Dark Days’ at face value with all this bright warm sunshine around! 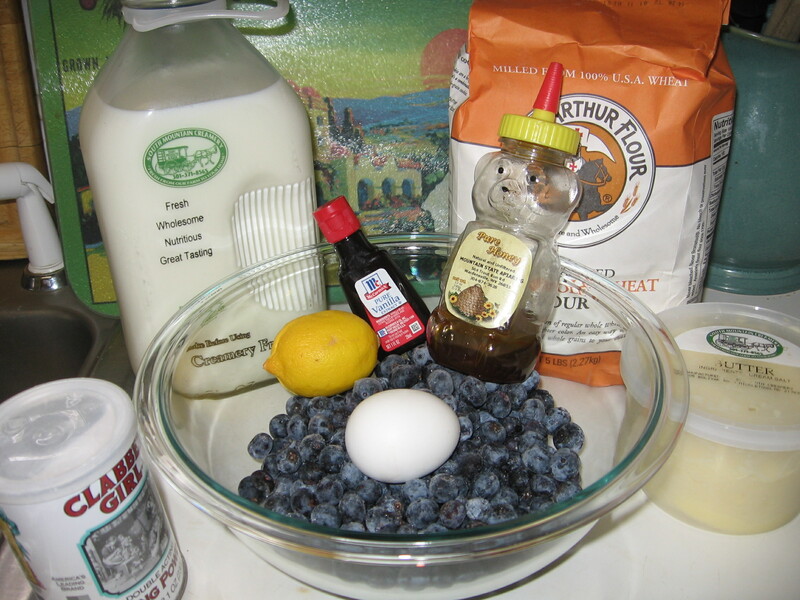 If you pop in here, put your recipe links in the comments! Did you cook a Dark Days meal this week? We would love to hear about what you made. Last week we had a chance to see what the WEST cooked up for the Vegetarian Challenge. This week the EAST will show us what they are made of as they take their turn going vegetarian. Many of the participant are vegetarian or vegan and it is still fun to see how both the meat-lovers and the vegetarians challenged themselves this week. Annie (MD) from AnnieRie Unplugged is recovering from some surgery so her husband stepped in for this challenge. For part of Annie’s meal he heated up some local applesauce, then whole wheat pasta & topped it off with both local tomato sauce & mushrooms! For his meal he also made a nice salad made up of veggies from their CSA – spinach, radishes, Chevre, drizzled w/Catoctin Mountain Orchards Blackberry Splash Vinaigrette. 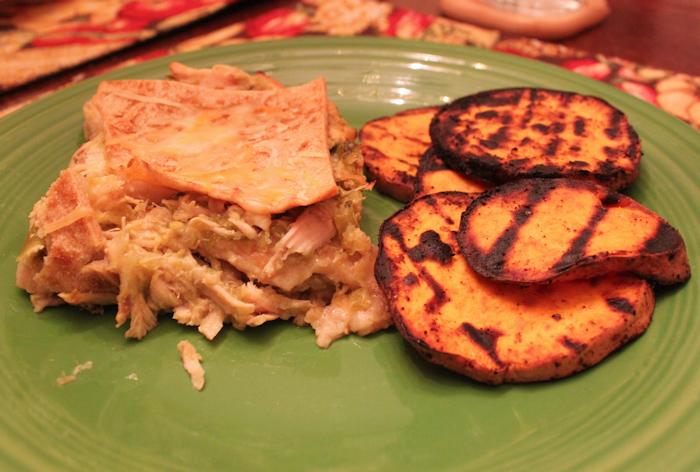 He also cooked up some sweet potatoes (Annie was able to have those too). After a wonderful meal like that I am sure Annie is on her way to recovery. 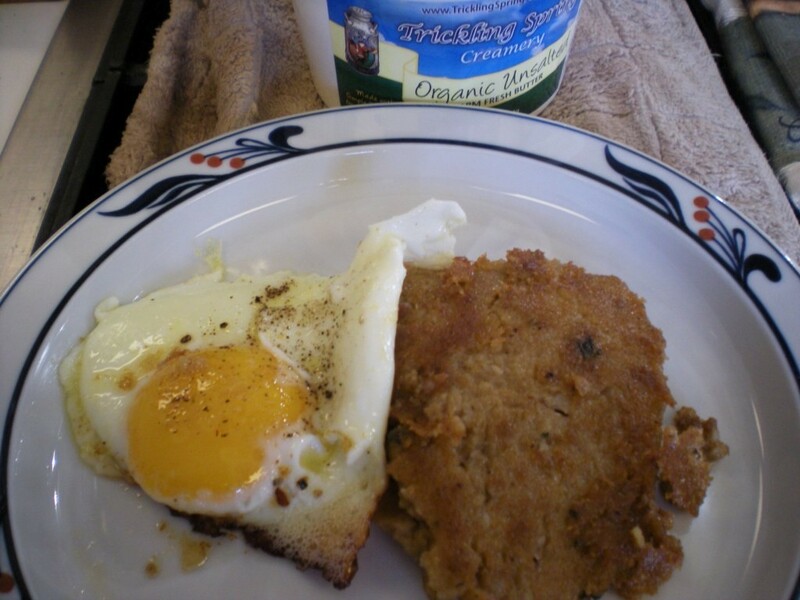 Stop by her blog to read more about this meal & her local resources & send her some get-well wishes! 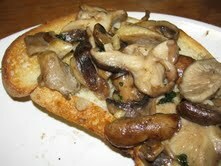 Susan (VA) from Backyard Grocery (meat-lover) had fun with this vegetarian challenge. 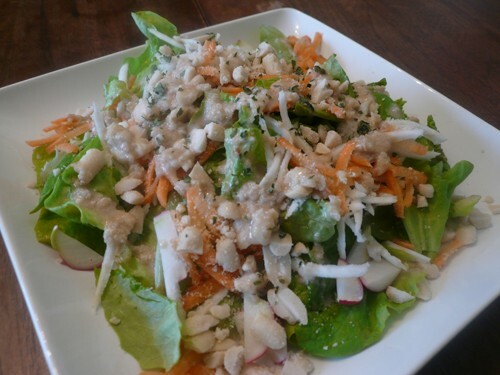 Lettuce from the garden inspired her to made a peanut salad with an apple peanut dressing. She found peanuts for her protein and added garden greens, carrot, celery root, & radish to her salad. 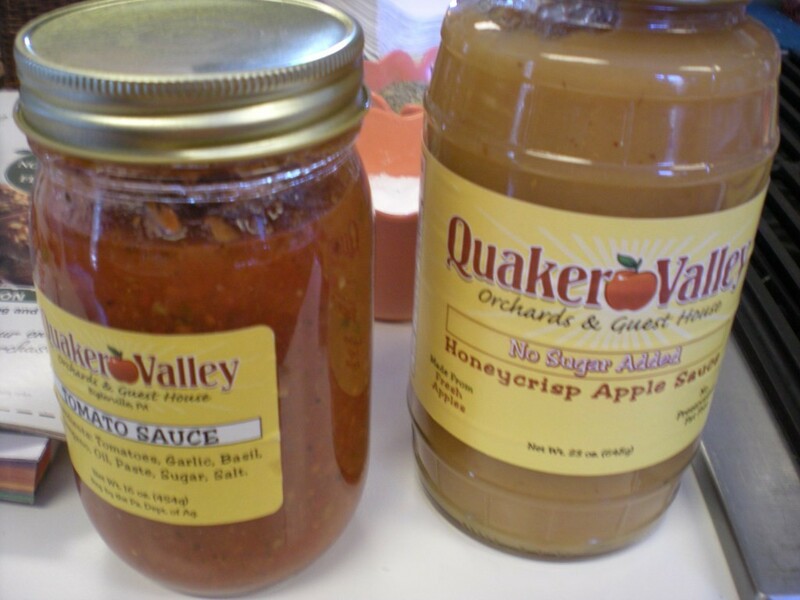 The dressing was made w/apples, hot sauce, peanuts with the help of a food processor. 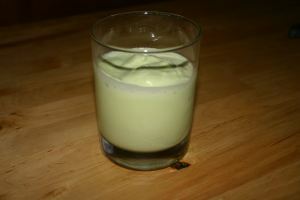 Head over to her blog to see her recipe. Jessica (SC) over at Eat.Drink.Nourish. made a delicious looking creamy baby potato and leek soup this week. Most of her time was spent cleaning the sand out of the leeks, but it was worth it. Once the potatoes & leeks were in the pot, she added some thyme from their garden & let everything simmer away. 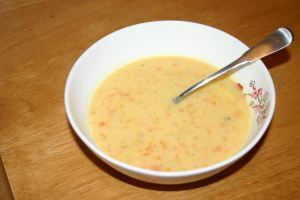 She then pureed it with the an immersion blender, added some cream and topped each bowl with some shredded local cheese. What a meal. Visit her blog to read more! Victoria (MD) at The Soffritto two-thirds of the household was able to stick with the veg challenge this week. 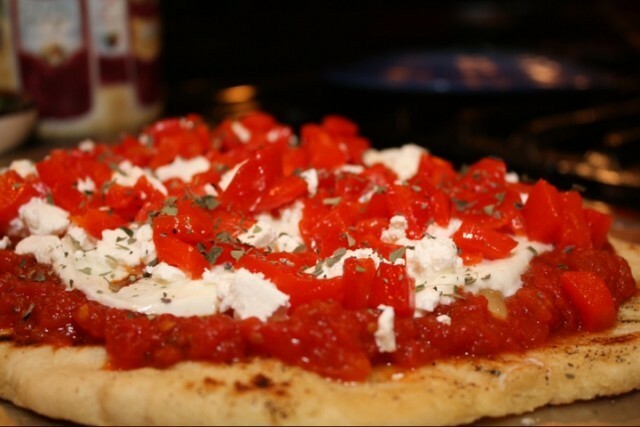 With all hands on deck they set out to make feta & roasted pepper pizza using home-grown, roasted & canned peppers, homemade tomato sauce & local feta. Dad, however, couldn’t resist the temptation of sausage, so he made his own pizza and added the sausage. With their little helper on board, it looks like they had a lot of fun. 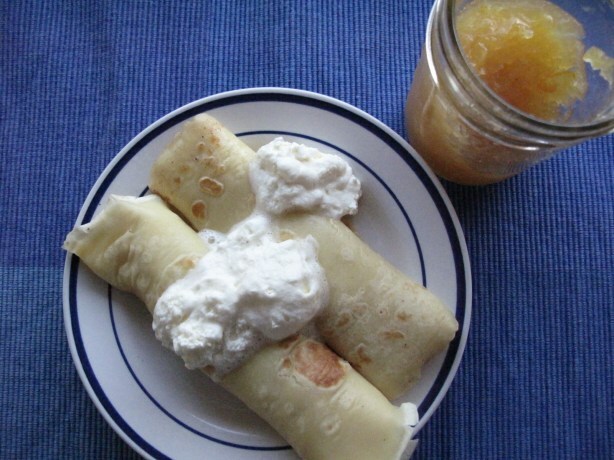 Head over to her blog to read their recipes and see their local resources too. Rebecca (VA) from Eating Floyd cooked some amazing dishes for the veg. challenge, & I have no idea where to start. She made savory baked garbanzo beans (one of her favorite ways to eat chickpeas!) She also made gujerati-style hot sweet & sour potatoes (those are calling out to me) & then she braised some baby bok choy. OH wait, how could I forget – she made black bean walnut brownies….yes, you read the correctly! To that she added a scoop of ice cream & a drizzle of black forest cherry preserves. Why are you still reading this… head over to her blog to see it all! Jes (VA) from Eating Appalachia is a bit bogged down getting ready to leave on a trip to Europe for over 2 weeks. She (being vegan) had to laugh since this is the week for the Vegetarian Challenge and she almost missed out on it! Not much is happening in her kitchen right now, but she did eat out at a local restaurant that caters to vegetarians and vegan with a focus on locally sourced food. 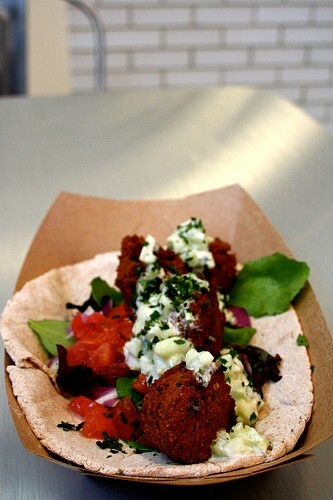 She loved their falafel and the “Incan Bowl” with black beans, sweet potatoes, corn & quinoa were wonderful. The sweet potato & coconut soup was wonderful also. 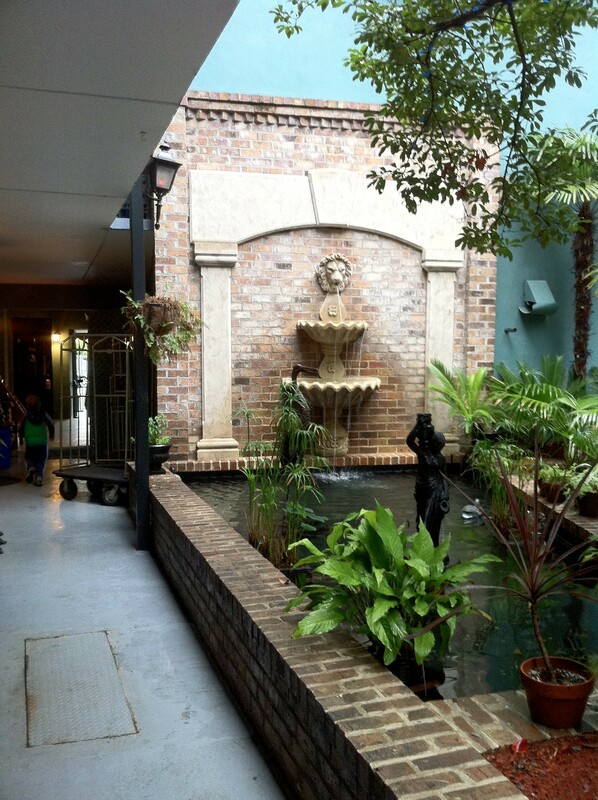 Stop by her blog to read more and find out where this great restaurant is. Liz (VA) from Family Foodie Survival Guide had a successful trip to the farmers market and found many things to go into her meal this week. 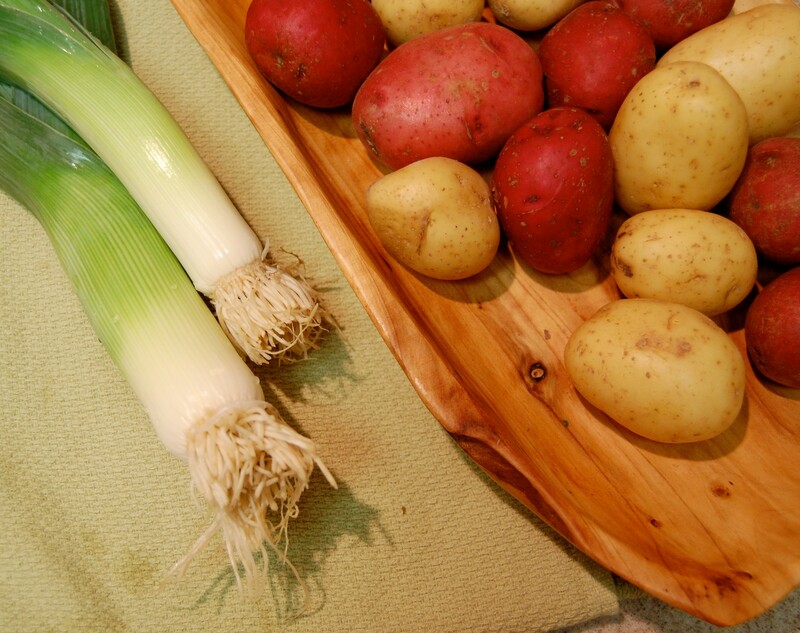 Liz made potato-leek soup with the potatoes and leeks found at the farmers market. 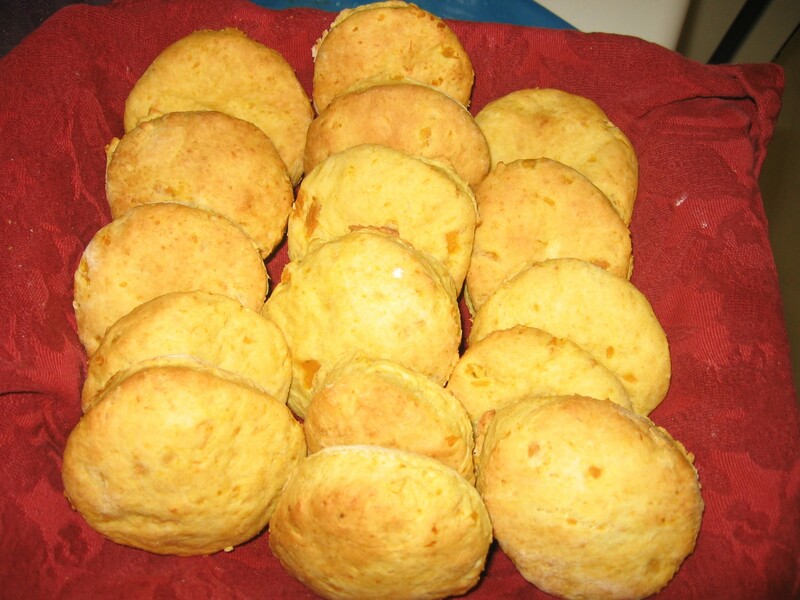 To go along with the soup, she made some nice looking sweet potato biscuits and had a nice salad too. 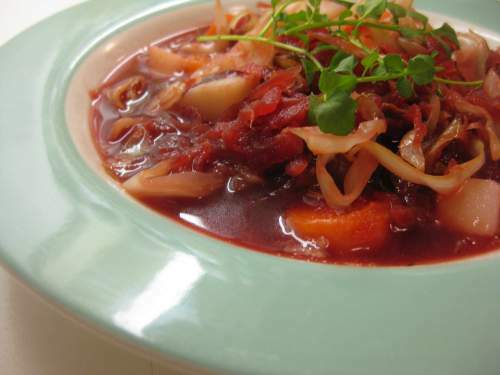 Visit her blog for all the details of her local finds and her soup recipe. Monika (NC) from Windy City Vegan has been traveling for work this past week and she was still able to come up with several DDC meals in Chapel Hill, NC where she was staying. There is a café she frequents that is complete with its own kitchen garden and Monika even sees the owner at the local farmer’s market purchasing food for the café from local farmers. Monika brought salad fixings from her garden at home & combined those throughout the week with meals from the Curryblosson Café. 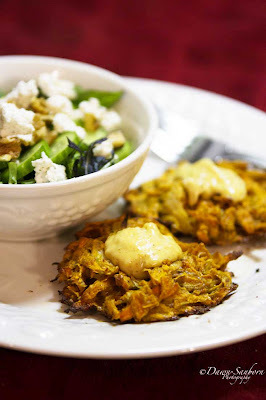 She had Seasonal Bhaji with some of the salad she brought from home. Another notable meal was Vimale’s Original Uttapam which is a large onion & cilantro pancake made with rice & bean sourdough batter. Head over to Monika’s blog to read more about this café with a community feeling and more on Monika’s traveling meals. This week we have our third mini-challenge for the Dark Days Challenge. 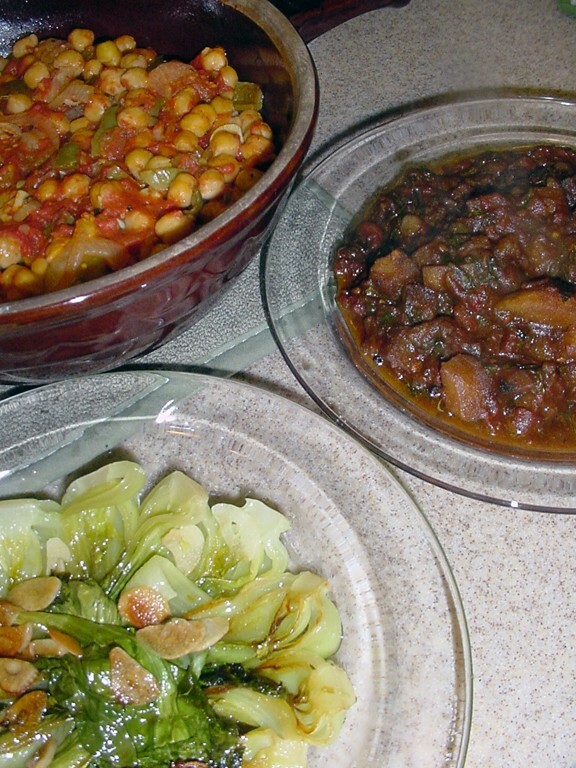 Vegetarian Theme. For some of the carnivores participants this is a big challenge, for other carnivores it isn’t. And it will be interesting to see what the vegetarian and vegan participants cook up as well. Did they challenge themselves to try something new and different? 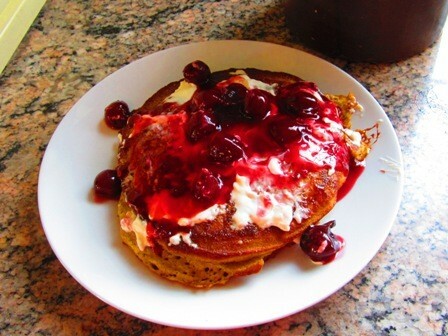 Lynda (CA) from Cortina Creek made some wonderful looking sourdough pancakes this week. Lynda grows and grinds her own wheat and the sourdough starter has been growing for 3 generations originating with her grandparents (what a treat!) She used cherries that she had preserved from a farmer’s market last summer, she used eggs from her chickens and she made the cheese using local milk & cream. The oil came from her son who grew and pressed the sunflowers himself. I would say, not only was this a local and vegetarian meal, but it was mostly from family grown and raised ingredients. This wasn’t much of a challenge for the vegetarians over at d.i. wine & dine. 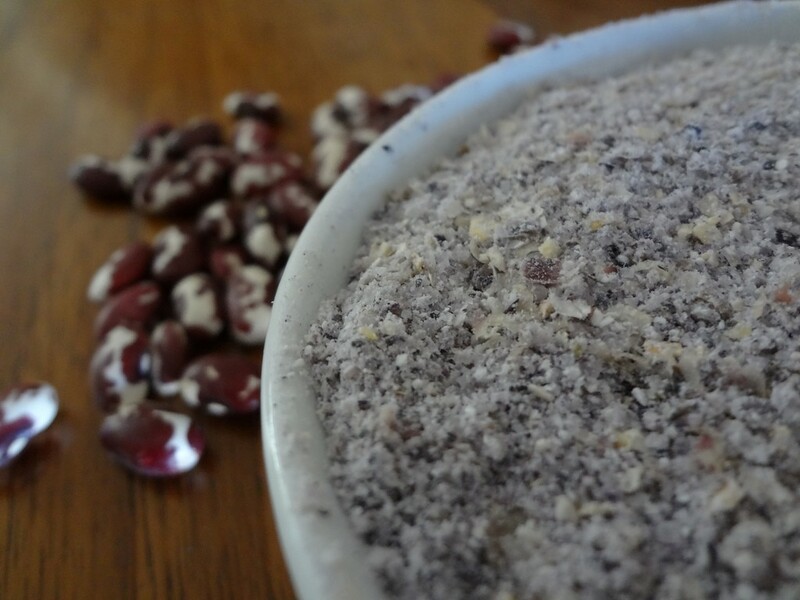 Instead of just another “normal” meal for them they decided to challenge themselves and make blue corn tortillas using local blue corn meal. 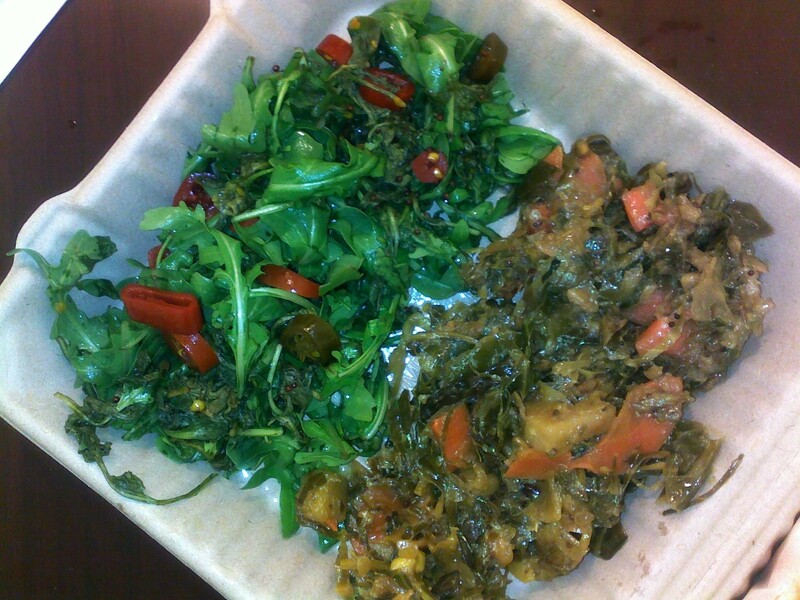 The local ingredients go on and on with anasazi bean, spinach and potatoes. They also added another layer of flavor using a mostly local homemade peach salsa. Head over to their blog to see more photos and read more about their challenge. 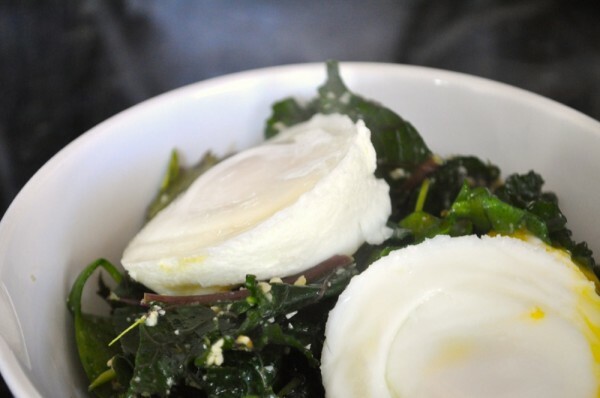 Teresa (CA) from Not from a Box wasn’t super challenged by the vegetarian meal this week, in fact eating vegetarian meals is a normal occurrence around her place. Coinciding with the DDC was lent and as she had done in years past, she gave up meat again this year. 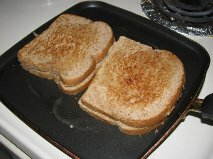 She prepared a flavorful parsnip and apple soup and paired it with a nice looking grilled cheese sandwich. Her list of local ingredient is long and impressive. Visit her blog to read more. Amusingly, the first post I opened for our vegetarian challenge, from the entertaining WoohooTofu (ironic name there) boldy proclaimed “Crazy for Chicken.” She gets them by the boatload, something I may try for the summer when my freezer isn’t full of frozen veggies. She made a lovely family heirloom chicken soup. Oh course it wasn’t Woohoo that I was worried about. After her gorgeous celeriac a gratin two weeks ago, I’m fully confident that she can whip up vegetarian with one hand tied behind her back. I was a little concerned with game-loving Sanborn Sanctuary, but they came through, although not without editorializing meat. 😉 We’ll have to award flying colors here, for sweet potato latkes with garlic aioli. I am making this for dinner tonight. 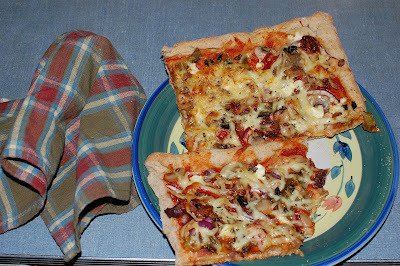 My other meat eater, at Backyard Farms, also stepped up to the challenge, with that vegetarian staple food, pizza. Dave at Happy Acres checked in at the last minute. Another inveterate meat eater, they made some lovely meals nonetheless. He caught this season of bookends perfectly with spinach (new and fresh and grown in spring) and a lovely roasted sweet potato (preserved from last year’s harvest). I won’t spoil it by mentioning that they served it with steak. (oops) And vegetarian theme notwithstanding, I have to bring up their amazing “southwest chicken pot pie” made with tortillas and green tomato salsa. UPDATE: Thank goodness I went looking for the wonderful, thoughtful MNLocavore.com this morning. I wanted to see why she had dropped out of the Challenge. Turns out no such thing. She’s in it and as thoughtful as ever. Her post reminded me of my daughter confessing that she’d made breakfast for a vegetarian friend, but had first made some bacon for herself before cooking eggs. She didn’t think to clean the bacon grease out of the pan. 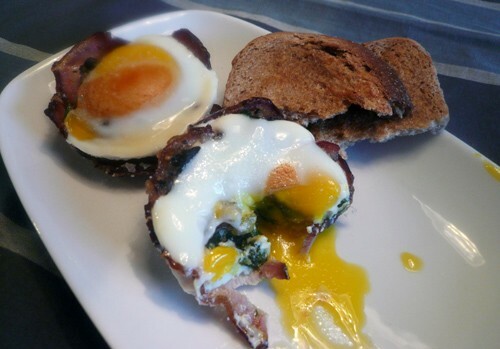 “Wow,” her friend said, “why are these eggs so delicious? !” Yeah, bacon. Here also is her post from February 8, another vegetarian option. 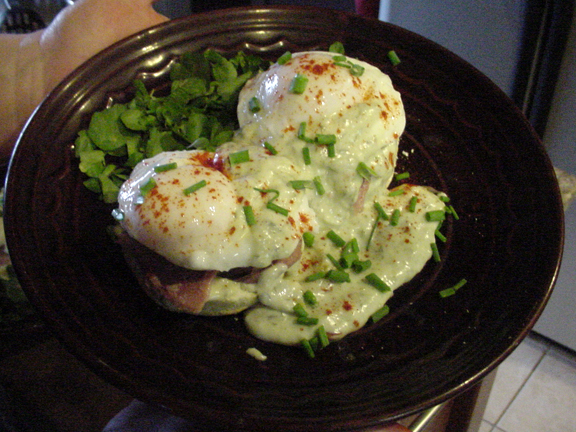 Up here in the blustery Northwest my blogging neighbors have been cooking up some yummies. It seems crustless quiche were popular for our veggie challenge. 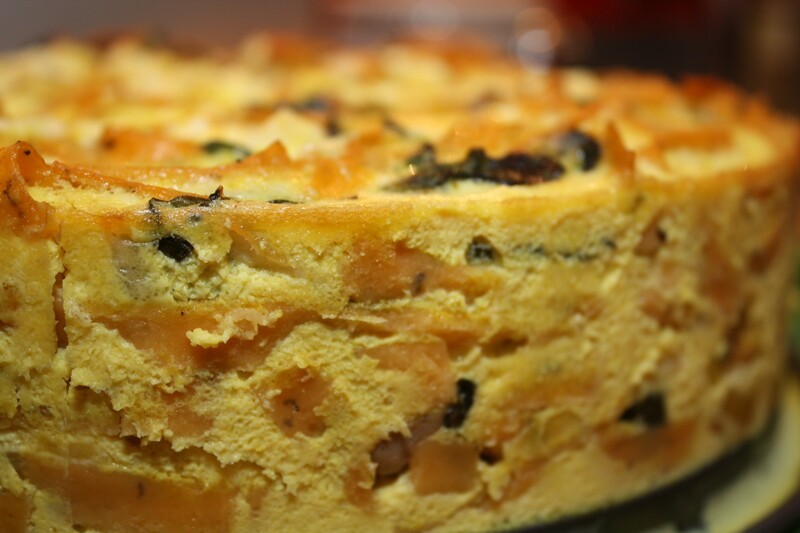 Along with my fritatta, Farming Mom got back into blogging action to tell us about her yummy “egg cake” for the veggie challenge, a chocolate mousse for the dessert challenge and a bunch of other local fare. 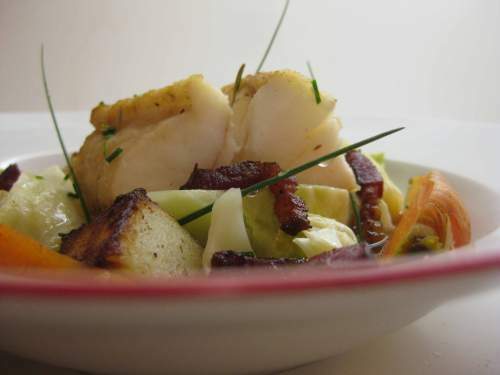 If you’re in the NW, check out her post for some great local resources of SOLE foods. 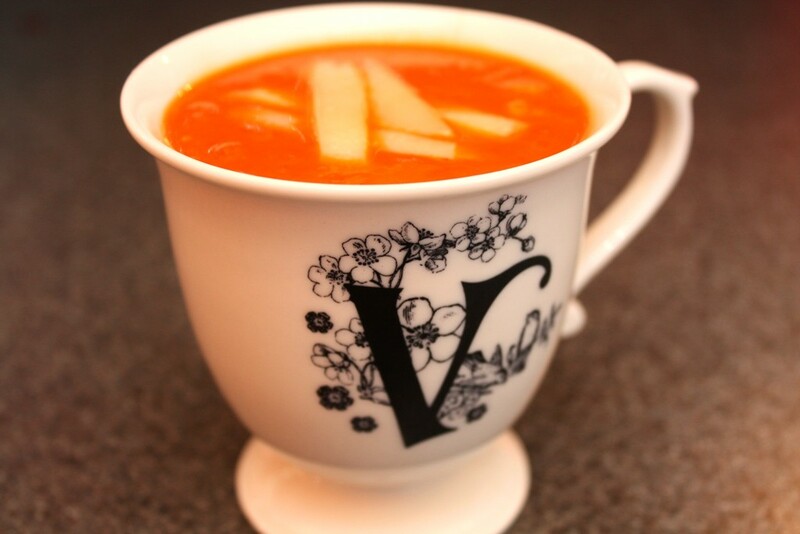 Be Creative snuggled up with some delicious looking tomato soup after a chilly walk in the rain, and it may not be long until she shows up with a quiche or fritatta as well: her chickens are laying! We are now 3 months into the Dark Days Challenge. As I read different blog posts from different participants across the country I am starting to see come common challenges for some of the participants out there. In certain areas, some people are very low or running out of stored fall vegetables like squash and potatoes, and at the same time, they do not have farmer’s markets open in their area at all. Many areas have very active year-round farmer’s markets and that really makes things easy for them in terms of finding local foods. With those open markets it also helps keep with a seasonal eating theme. 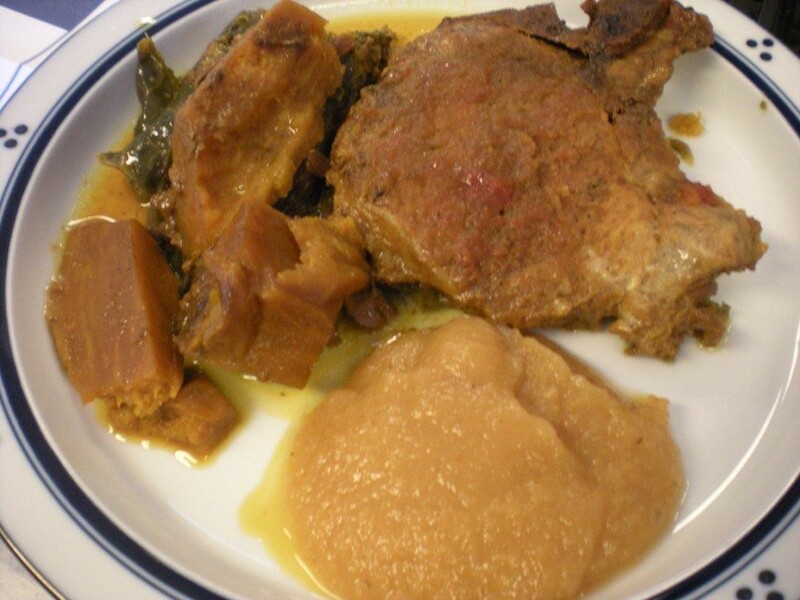 Annie (MD) from AnnieRie Unplugged shared her Valentine’s Day meal with us this week. 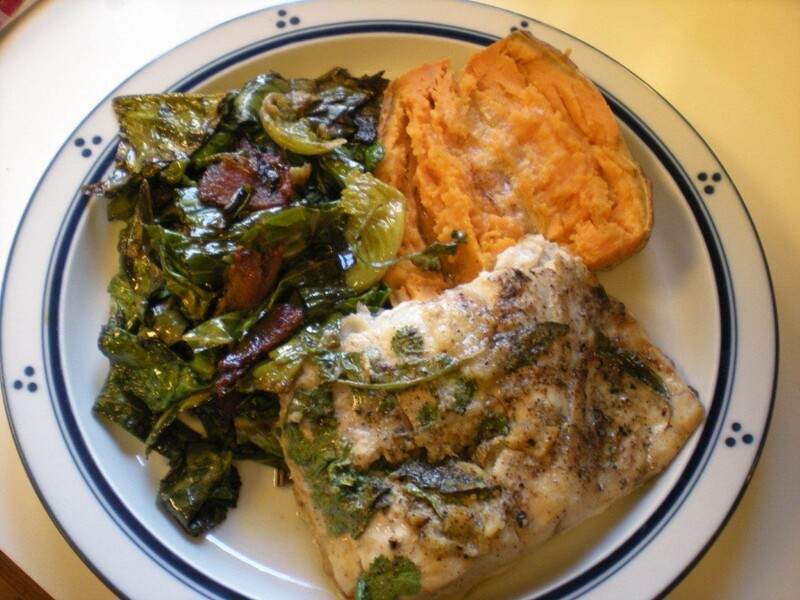 Annie made marinated local rockfish (also know as striped bass), a beautiful sweet potato and a side of collard greens sautéed with bacon, onion and garlic. She also made an all-local, nice side salad using fresh bib lettuce, baby beets, bleu cheese with peach vinaigrette. 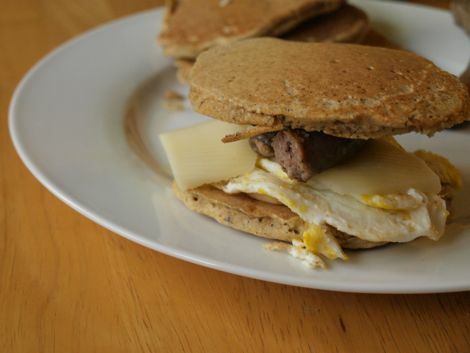 Head over to her blog to read more about her meal and see her local resources. 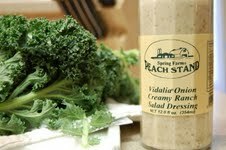 Liz (VA) from Family Foodie Survival Guide stopped at a small farmers market near her house this past weekend and found some ingredients for to use in her meal this week. 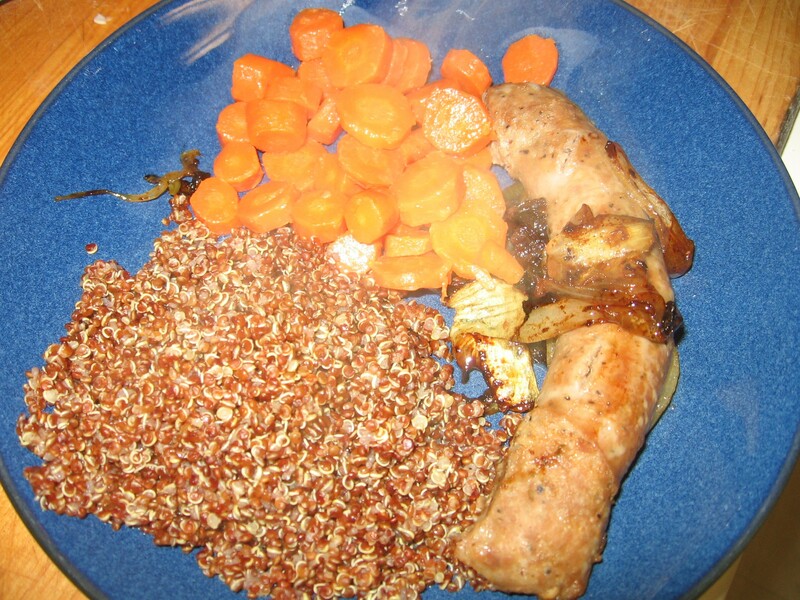 She cooked up some sausage and onions and added a side of carrots and a nice helping of red quinoa too. She says that “Sometimes, the SOLE dinner is the easiest one in the fridge.” Visit her blog to see additional photos and read about the small market she stopped at. Monika (NC) from Windy City Vegan made a beautiful Korean bibimbap for her meal this week claiming that it is not only a fun word to say, but it is another great way to get a variety of vegetables into her family without a replying on a sauce or a soup. 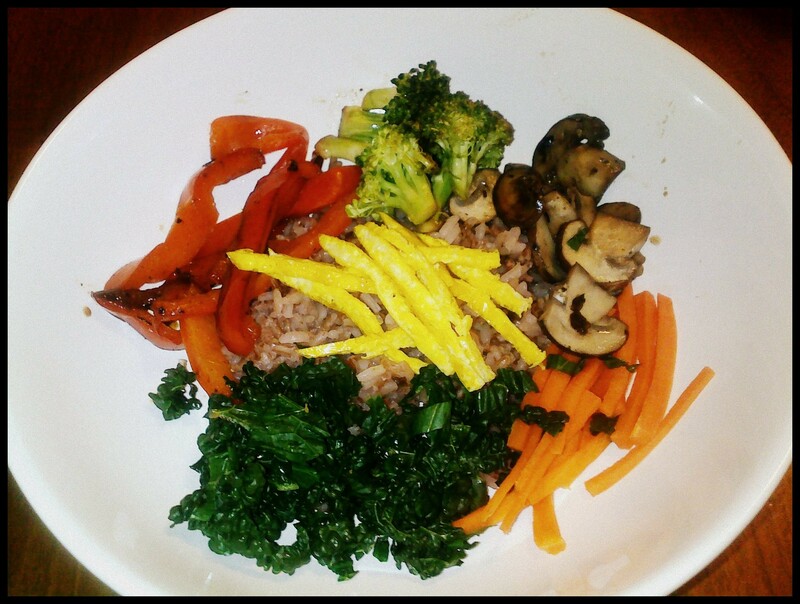 She used kale, mushrooms, carrots, broccoli, sweet peppers and rice for her local ingredients. She also added sprouted tofu for her protein. Presentation is everything with this dish. 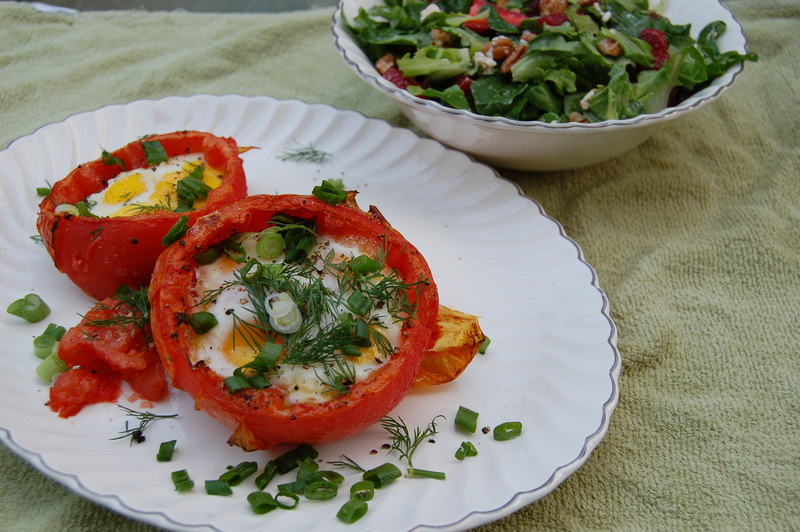 Stop by her blog to read more about this fun dish, its presentation, and see her recipe. Jessica (SC) from Eat.Drink.Nourish. ate out and ate local! While on a weekend trip to Charleston, SC they ate at great restaurant that prides itself on using fresh, local ingredients to create low-country cuisine — they even list their local farmer resources on the menu! Although she doesn’t have a photo of her meal, it does sound delicious – roasted beet salad with house-cured duck and entree of shrimp and grits. YUM. Visit her blog to read about the restaurant they went to. Rebecca (VA) from Eating Floyd is starting to run low on some of the vegetables she had cellared from last fall. She is also having to make more frequent trips to a place called Green’s Garage (no car maintenance there – just local foods) more often, but the pickin’s are getting more and more slim, especially for fresh local greens. 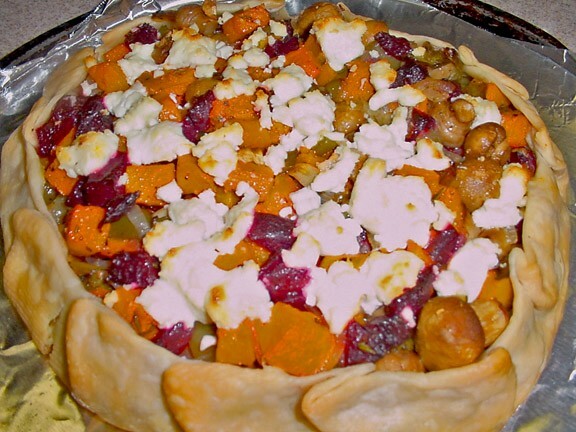 This week she cooked a beautiful roasted fall vegetable tart. 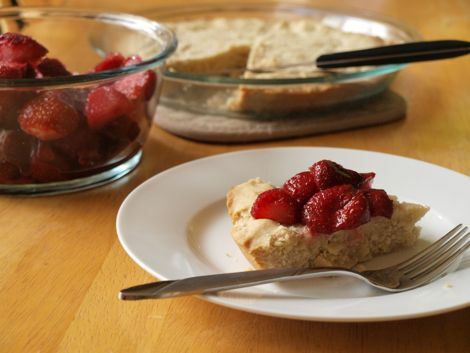 Head over to her blog to read more about her challenges and see this beautiful tart. Victoria (MD) from The Soffritto made a spicy salsa soup this week using a jar of homemade salsa, homemade chicken stock, home-grown & canned roasted red peppers and a splash of local cream. How’s that for local! The soup was served topped with a bit of local cheese. I have been drooling over the photos of her canned items, dreaming that one day I could also have such beautiful canned items in my pantry. 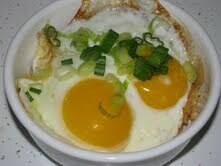 Stop by her blog to see more photos and her recipe too. Jes (VA) from Eating Appalachia had the sun shining with 65F one day and 7” of snow the next. She didn’t let that stop her from making a nice kale & arugula salad with roasted acorn squash that was both eye catching and filling. 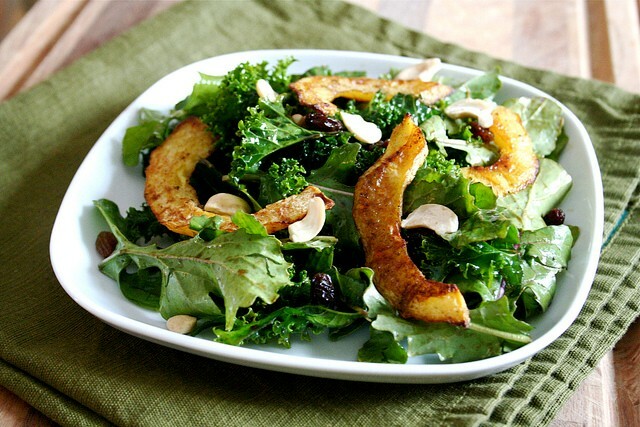 With flavor combinations from herbs and spices along with some extra busts of flavor from the raisins and cashews, her salad looks great for spring, summer, winter or fall. 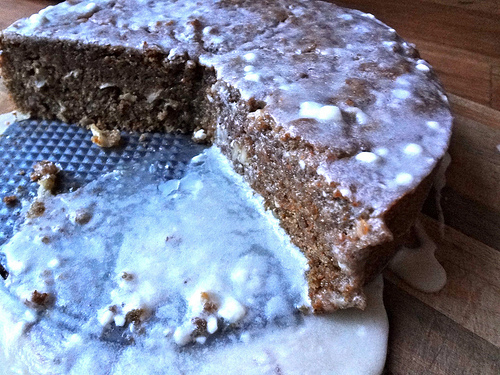 Visit her blog to see her recipe and some photos from her winter wonderland. Susan (VA) from Backyard Grocery had a few hectic, yet exciting weeks. It was time to slow down and have a nice local home-cooked meal. 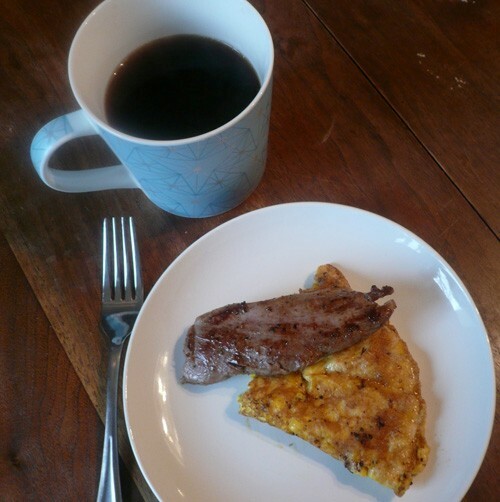 She made venison tenderloin and an omelet for breakfast. This high protein meal was all local. 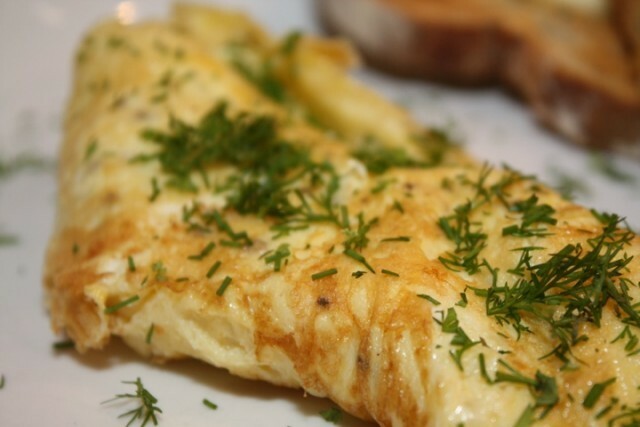 The venison tenderloin was pan friend in butter and the omelet was made up of a local duck egg and local chicken eggs and a bit of local cheese. 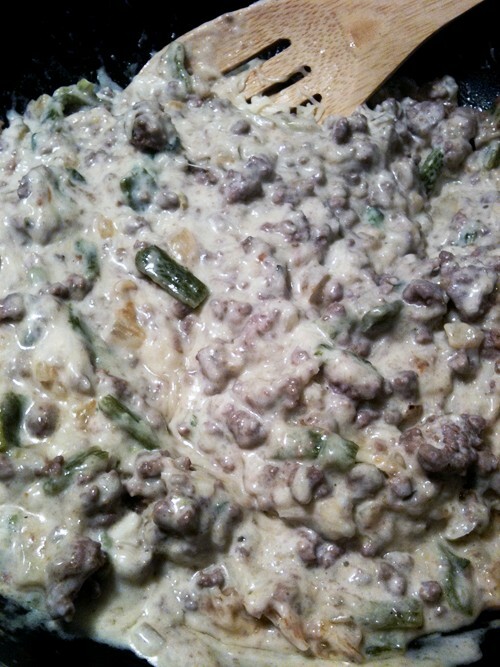 Stop by her blog to see more photos and a great step-by-step of her cooking process. What is challenging you in your area? 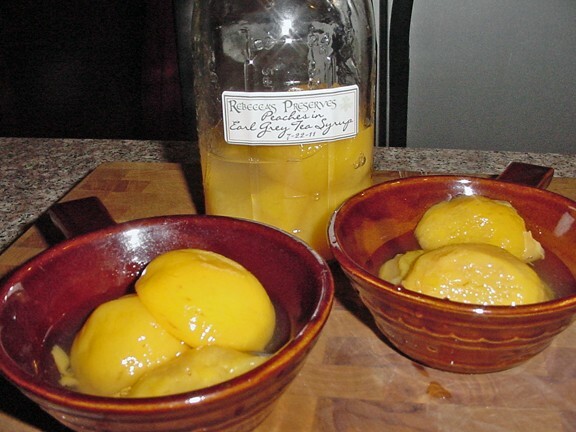 Are you starting to get low on some of your homegrown preserved & stored foods? Are your farmers markets all closed or still going strong?